The estate spreads over 1500 acres (600 hectares) of meadows and woods, offering a variety of paths for hikes, horse riding and – most exciting – the search of white and black truffles with specifically trained dogs (we can organise this for you). Signposted paths completed by instructions given by the owner will open up this nature reserve to you, where you will be able to see deer, roe, porcupines, wild boar and pheasants. However, Umbria’s cultural and gastronomic abundance is not far. Landmarks such as Gubbio, Gualdo Tadino, Nocera Umbra, Perugia and Assisi can be visited in half or full day trips. 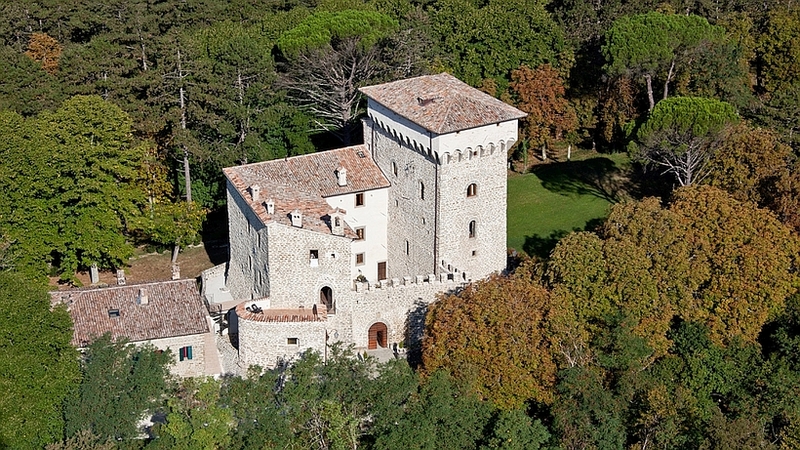 Amidst a beautiful untouched countryside stands the castle of Magrano. First mentioned in the early Middle Ages (1200 ac) playing a strategic role in the defence of Gubbio against Perugia, in the 15th century it became one of the favourite hunting lodges of Federico da Montefeltro, Duke of Urbino and Gubbio. His famous profile portrait by Piero della Francesca hangs in the Uffizi Museum in Florence. A few centuries later, in 1830 to be precise, Princess Giulia Bonaparte, niece of Napoleon, became the new mistress of Magrano. Remo and Maria Camilla Giunta, the charming actual owners, are her direct descendants. The Castello di Magrano lies at 5 minutes by car from the village of Carbonesca and a 30 minute drive from Gubbio. Gubbio is best known for its palio, the Corsa dei Ceri, a spectacular run held every year on May 15, in which three teams run through throngs of cheering supporters up much of the mountain from the main square in front of the Palazzo dei Consoli to the basilica of S. Ubaldo, each team carrying a statue of their saint. Assisi: Festival Calendimaggio, held on 1–5 May, is a re-enactment of medieval and Renaissance life in the form of a challenge between the upper faction and the lower faction of the town. It includes processions, theatrical presentations, flag-weavers and dances. Magrano estate – The castle of Magrano lies within a large estate which is the natural habitat of fallow deers, pheasants, wild boars and many other kind of animals. It is possible to take a guided tour of the estate with the owner or the estate manager, by car or on foot. Magrano estate – trekking: the estate has a large number of signposted treks of all different levels. Beautiful experience. Magrano estate – the estate lies on the river Chiascio which is excellent for fishing. Bring your own rod or hire one nearby. Magrano estate – Truffle hunting: in certain months of the year, you can follow the truffle hunters with their specially traines dogs”. Dig in! The Natural Park of Monte Cucco is a protected area not far from the castle, covering a land surface of 10,480 hectares (24 thousand acres). The Park is famous for its subterranean rivers and mineral-water springs, for its clear streams, great beech-woods and its limestone cave system, untouched by mass tourism. Trekking on signposted routes, mountain biking, pony-trekking, and for the more adventurous, canyoning, paragliding and hang-gliding (international championships are held here). Complete information on their website http://www.discovermontecucco.it.